After a quiet daytime, an intense snow squall is likely Friday evening ahead of an arctic cold front. Dangerous wind chills will develop this weekend. Much of Friday will be quiet with mostly cloudy skies. Southwest winds will help temperatures rise into the 20s. Lake effect snow will remain outside of the Finger Lakes. Be advised that heavy lake effect snow is ongoing in the Buffalo area this morning, so traveling towards Buffalo could be tricky. By this evening, the cold front will enter into western New York. A band of very heavy snow and gusty winds will accompany this arctic cold front. Visibility will drop to near zero within the squall and travel conditions will rapidly deteriorate. A quick one to two inches of snow will fall. Here is the approximate squall timing for some various locations in the Finger Lakes. These times are just approximations, and the squall could come sooner or later. Keep an eye on the radar. 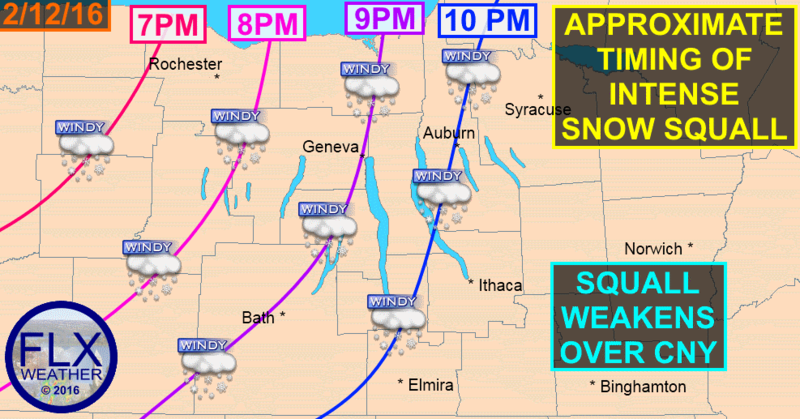 The squall should weaken as it heads into Central New York towards 11 pm. Behind the front, temperatures will drop into the single digits. By Saturday afternoon, much of the region will be below zero. Strong, gusty winds will create dangerous wind chills. Wind Chill Warnings are in effect for the entire area. Wind chills during the day on Saturday will range from -15 to -25. Overnight, as temperatures drop well below zero, wind chills could drop as low as -30. Areas further east will drop even lower. Frostbite can occur in as little as 15 minutes at these levels. Sunday will warm a little bit, with highs approaching 10 degrees. The winds will lessen by the afternoon, but wind chills in the morning will remain dangerous. As the arctic high pressure responsible for the bitter cold departs early next week, a storm system will develop. At this point, there is little doubt that there will be a storm. The details on what this storm will bring us is still uncertain. There may be a sharp cut off between mixed precipitation and low accumulations and very heavy snow. Nailing down where that will set up will be the primary question over the coming days. Should a band of heavy snow develop, it would likely only be 50-100 miles across, so even a small deviation in storm track could have major impacts on what our area sees. Continue to monitor the latest forecasts. Still extremely uncertain. The forecast should become more clear over the next two days.